North American blues circuit Guy Davis brings his unique and entertaining style to Harrison in April. 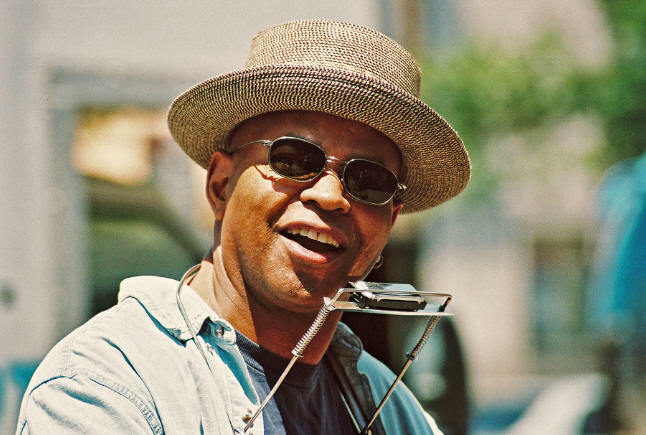 master storyteller of blissful woe, Bluesman Guy Davis will be sharing his good time acoustic Blues at the intimate Harrison Memorial Hall Friday, April 10 at 8:00 p.m. Whether Guy Davis is appearing on Late Night With Conan O'Brien, or in front of 15,000 people on the main stage of a major festival, or mentoring an intimate gathering of students at a music camp, he feels the instinctive desire to give each listener his and his 'all' is the blues. 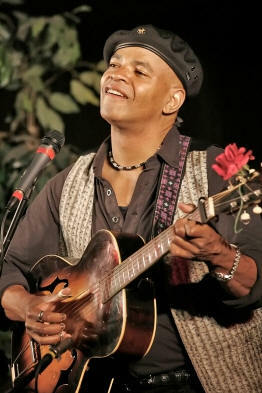 "I first heard Guy Davis at the Philadelphia Folk Festival in 1998," recalls Harrison Festival Society Artistic Director, Andy Hillhouse, "I was very impressed with how this one guy held the attention of an audience of thousands, with a very intimate, personal and narrative approach to singing the blues." Davis is a musician, composer, actor, director, and writer; but most importantly, Guy Davis is a bluesman. The blues permeates every corner of Davis' creativity. Throughout his career, he has dedicated himself to reviving the traditions of acoustic blues and bringing them to as many ears as possible through the material of the great blues masters and his own original songs, stories and performance pieces. "Guy Davis is a classic blues troubadour, and takes the audience on an emotional and historical journey through the blues in every show he does," says Hillhouse. Davis' roots as an artist run deep. Though raised in the New York City area, he grew up hearing accounts of life in the rural south from his parents and especially his grandparents, and they made their way into his own stories and songs. Davis taught himself the guitar (never having the patience to take formal lessons) and learned by listening to and watching other musicians: for example, he learned finger picking from a nine fingered guitar player on an overnight train ride to New York. Juggling his loves for both acting and blues music from a young age, Davis made a name for himself in both television and film before finally marrying his passions in the theatre. After roles in Broadway's Mulebole and the off-Broadway hit Robert Johnson: Trick the Devil (in which he played blues legend Robert Johnson) he put pen to paper and wrote the acclaimed one-man-musical In Bed With The Blues: The Adventures of Fishy Waters, a jumping off point for his career as a writer-director-performer triple threat. "His theatricality comes through in his assured and charismatic performance style," says Hillhouse. In recent years Davis has been telling most of his stories through song, whether it's writing, arranging and performing the soundtrack for Emmy Award-winning film To Be A Man, collecting rave reviews for his long list of releases, or delivering intimate performances at festivals and concert halls across North America. Davis is an engaging performer, but it's more than his gritty vocals, quick guitar picking and classic blues vibe that captures his audiences. He represents the blues from both sides: the harsh truths and heartbreaks and the foot-stomping, hand-clapping heck of a good time. 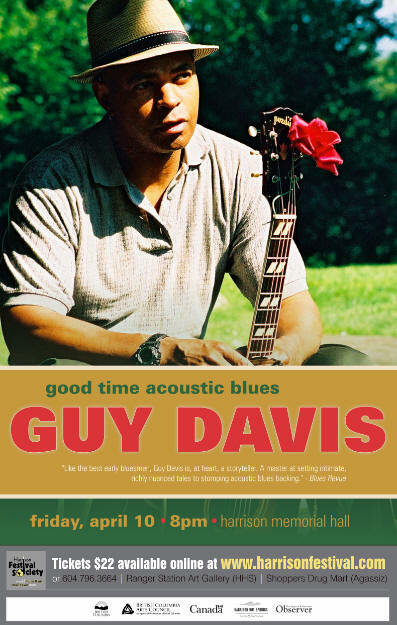 Tickets for Guy Davis are $22.00 and can be purchased online at www.harrisonfestival.com, by phone at 604.796.3664 or in person at the Ranger Station Art Gallery in Harrison and Agassiz Shoppers Drug Mart on Pioneer Ave.